Founded in 1985 at Teachers College, Columbia University (and formerly known as Fellows / USA), the Coverdell Fellows Program is now a network of partnerships between the Peace Corps and more than 90 universities across the country. Competitively selected Coverdell Fellows undertake service internships in high-need American communities and receive financial aid while working toward their graduate degrees. Returned Peace Corps Volunteers may apply to enroll in a Coverdell Fellowship at participating universities at any time after successfully completing Peace Corps service. The College of Agriculture Consumer and Environmental Sciences is one of two colleges at New Mexico State University that houses a Paul D. Coverdell Fellows Program. 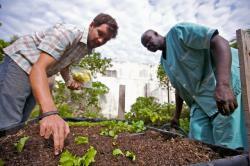 The College of Agricultural, Consumer and Environmental Sciences (ACES) began its Coverdell Fellows Program 2009. 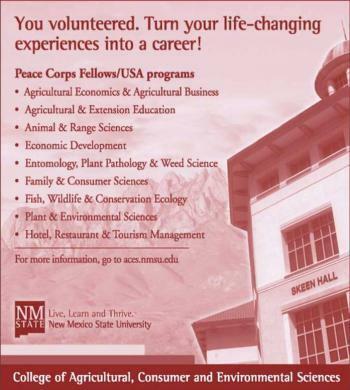 The NMSU College of Health and Social Services also houses a Peace Corp Program. M.S. degrees in Plant and Environmental Sciences, Agricultural Biology, , Agriculture Economics and Agriculture Business, Animal Science, Range Science, Family and Consumer Science,, and Fish, Wildlife and Conservation Ecology. Ph.D. degrees in Animal Science, Plant and Environmental Sciences, Interdisciplinary Water Science and Management, and Range Science; and a Doctorate in Range Science; and a Doctorate in Economic Development (DED) offered jointly with the NMSU College of Business. Designed for incoming students, Peace Corps Coverdell Fellows is a graduate fellowship program that allows returned Peace Corps volunteers to bring a wider perspective, international experience, and a diverse knowledge base to the classroom in exchange for financial assistance during their studies. The skills learned as volunteers through adapting to new cultures, developing and managing projects, dealing with language barriers, and leveraging limited resources are valuable assets to the university. In return, Coverdell Fellows may receive graduate assistantships in teaching or research from their respective department contingent on acceptance to the department and available funding. This qualifies the Coverdell Fellows for in-state tuition and health insurance coverage through the university. Simultaneously contact both your intended department and the ACES Peace Corps Programs Coordinator to indicate interest in the program and gather information. Maintain contact with your intended department and the ACES Peace Corps Programs Coordinator for any questions or additional information.